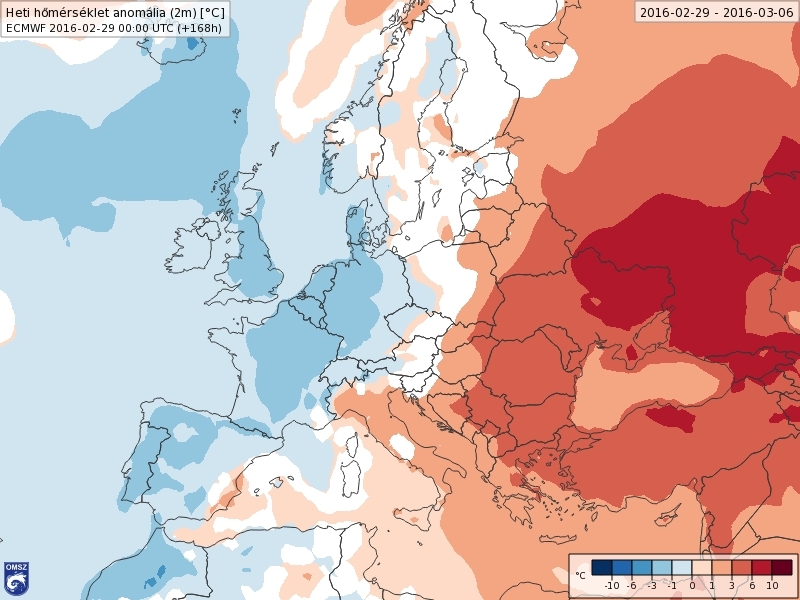 1 July 1994 Hungary became a co-operating state of the European Centre for Medium Range Weather Forecasts (ECMWF) as first country from Central Eastern European region. The basic aim of the forecasting centre is to provide medium range numerical weather forecasts of high quality. ECMWF is operationally running global deterministic and ensemble models covering the whole Earth (Fig. 1). You can find comprehensive information about ECMWF and its activity on its web site . The Hungarian Meteorological Service has access to the whole range of ECMWF's products, as Hungary is co-operating state of this organization. Comprehensive guide can be found on ECMWF web. After ratifying the amended convention of the ECMWF since June 2010 co-operating state can apply to become full member of the organization. Till the beginning of 2016 four countries – Island, Slovenia, Serbia and Croatia– became the full member of ECMWF. Hungary could start the preparatory steps after resolution 1492/2011 (XII. 27.) of the government was accepted. Weather forecasting could not be perfect due to for reasons. First of all full initial state of the atmosphere could not be known. Due to uncertainties coming from the chaotic behaviour of the atmosphere some weather situations can be less predictable. In any numerical weather prediction models model could not be perfect and some approaches are needed during solving the mathematical equations. During forecasts made by any numerical models success depends on several reasons. Usage of the huge amounts of the high quality - surface, upper air, satellite, etc - observations is essential. Observations always have smaller or larger errors, so monitoring of the errors is also very important. Numerical weather prediction models use regular horizontal and vertical grid network, but observations are located irregularly in space and occasionally in time too. Interpolation is needed between the two networks. In numerical weather prediction models atmospheric process can be formalised by laws of the physics, like equations of mass and energy conservations. The complex physical interactions could not be fully correctly written. Besides in the models solving of the equations needs to apply some approaching. The numerical forecast is calculated by integrations from the initial state. Final products provided for general public are generated by postprocessings from the model results. Considering the above mentioned problems ensemble modelling was developed about two decades ago. Ensemble models provide probability forecasts. The ensemble method takes into account uncertainties in observations, applied numerical models and physical parameterizations. At the first step of the ensemble forecasting perturbed initial states are generated, then numerical model is integrated from each initial states. By using the full set of the ensemble forecasts it is possible to estimate the uncertainty of any forecasted weather elements. It is advised to study comprehensively the ensemble mean, full ensemble spread and probability distribution. Ensemble forecasts can be successfully used to predict extreme weather situations too. At the ECMWF in Reading (United Kingdom) a 10-day high resolution (deterministic) model based on 00 and 12 UTC analysis is operationally launched twice a day. The model is taking into account several physical interactions like ocean and atmosphere, soil wetness and atmosphere and snow covering and atmosphere. The model contains 136 layers between surface and 0.1 hPa pressure level in the vertical, the resolution of model is about 9 km in space (Fig. 2). Model errors are significantly growing in forecasting time due to the chaotic behaviour of the atmosphere and the insufficient initial observed data. Taking into account above-mentioned effects makes probability forecasts, so called ensemble forecasts. Using ensemble-forecasting technique smaller perturbations are given on the initial field of the model above sensitive areas depending on weather situation. In this way the model is starting from initial conditions more or less different from original analysis. After several days the differences may become higher even if the initial differences were small (Fig. 3). In the end of 1992 the first 10-day probability forecasts were made by using ensemble method. Since. The structure of the ensemble forecast is very similar to the high resolution one, only the spatial resolution of the model is less in order to decrease the long computing time. Horizontal resolution is recently about 18 km (Fig. 4). Number of the vertical layers is 90. At 00 and 12 UTC model runs up to 15 day and 06 and 18 UTC it runs up to 7 days. Developing forecasts of the extreme and severe events is one of the main aims of the long-range (2011-2020) Strategic Plan of the ECMWF. Due to the fact that forecast of severe events is an important task of the OMSZ as well, strong co-operation was established and several investigations have been made in this respect (Fig. 5). In last decade the results of the scientific researches could allow us to investigate influence of sea surface temperature anomalies on atmosphere. Lower boundary conditions as sea surface temperature, soil wetness and snow covering influence the state of the atmosphere. The El Nino phenomenon is significantly influencing the general circulation of the atmosphere. Using coupled ocean-atmosphere circulation models may extend the forecast range. The development of measuring technique can provide information on temperature in 500 m layer of the upper ocean. Satellite measurements give huge amount of information about wind speed, temperature and humidity. Numerical models drawing interactions between the ocean and the atmosphere were developed significantly the last several years. ECMWF started experimental seasonal forecast project in 1995. The first quasi-operational seasonal forecast was made in June 1998. Both monthly and seasonal forecasting ensemble models contain 51 members and its spatial resolution is 50 and 80 km respectively. 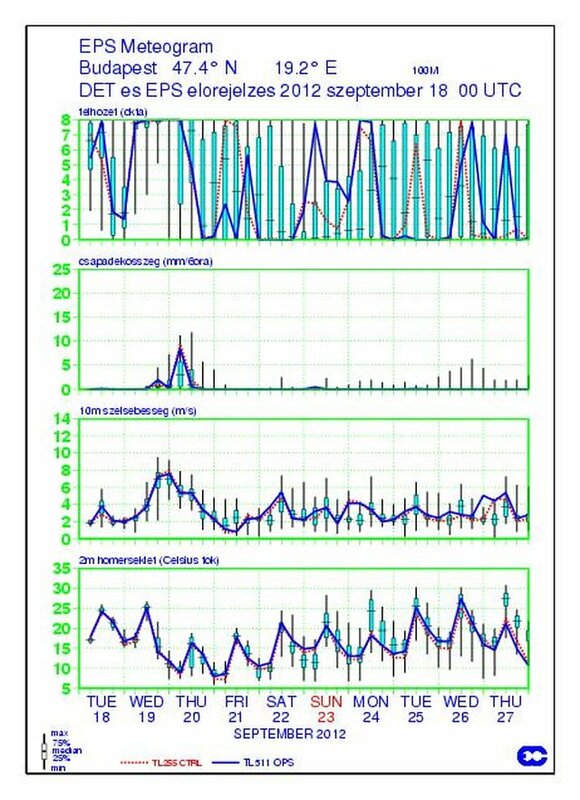 Nowadays monthly forecast is made twice a week, each Monday and Thursday and seasonal forecast (Fig. 6) is made once a month, 8th day of each month. Knowledge of the current state of the atmosphere is indispensable at gridded space where numerical weather forecasting model works. This state is given by mathematical methods, namely data assimilation based on current observations (surface, upper air, satellite, etc) and ultra short-range forecast of former model run, valid for the same time. Nowadays weather forecasting systems are very well developed, so due to this fact observations are much more accurately used at analysis then it happened a few decades ago. During production of so called reanalysis datasets state of the atmosphere can be described much more preciously by applying state of the art methodology on a few decades long observation datasets than it happened originally when analysis made. In addition applying unified data assimilation method on the whole time range will cause consistent dataset avoiding the inhomogenities coming for model developments. So reanalysis are much more suitable for studying the long range changing of the climate than operational analysis. Even reanalysis dataset can represent quite well the climate, there are some uncertainty due to errors in observations and modelling. First reanalysis, ERA-15 covering 1979-1993 was made in middle of 1990-s. In the beginning of the 2000-s ERA-40, covering 1958-2002 was made. In the middle of 2000-s ERA Interim project started, it provides reliable reanalysis from January 1979 up to near past and dataset is continuously enlarged in time. 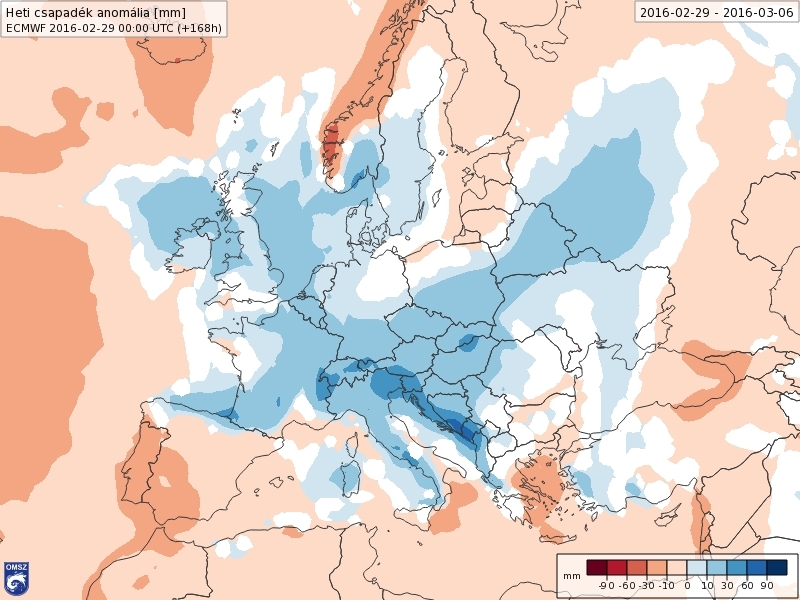 A new reanalysis project, ERA-CLIM funded by the European Commission under the 7th Framework Programme and involves ECMWF and several other organizations. The result of this project was a complete ERA-20C reanalysis covering the whole 20th century. Table I. contains main characteristics of the above mentioned reanalyses. Study of the cold drops by using ECMWF ERA Interim reanalysis database. Final outputs of the numerical weather forecasting models are available in binary format, so called GRIB files. In HAWK-3 visualization developed by OMSZ 2D horizontal and vertical cross sections can be displayed. In addition to own visualization method of the HAWK it is possible to display external image files too. 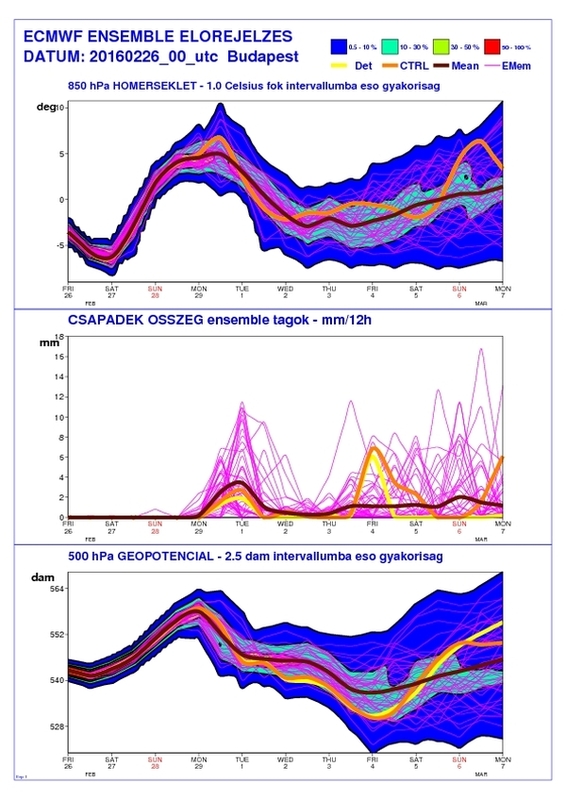 In the OMSZ wide-range of the graphical products, like ensemble meteograms, plumes, histograms, probability maps made by using MAGICS software. 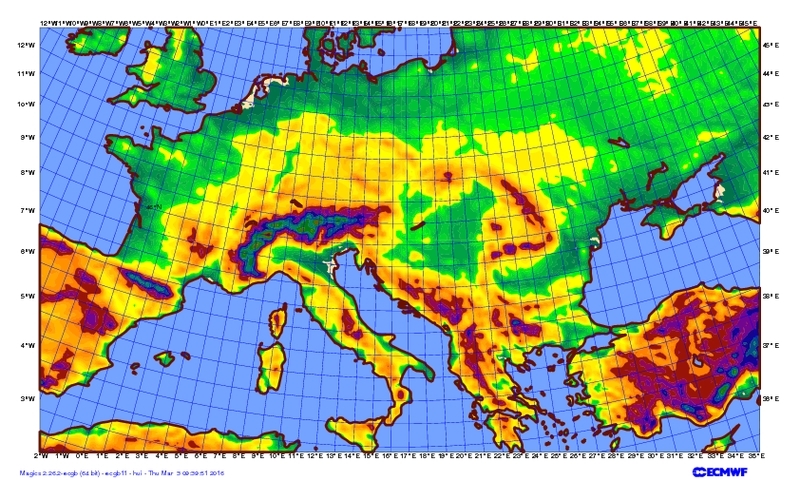 MAGICS software was developed by ECMWF. 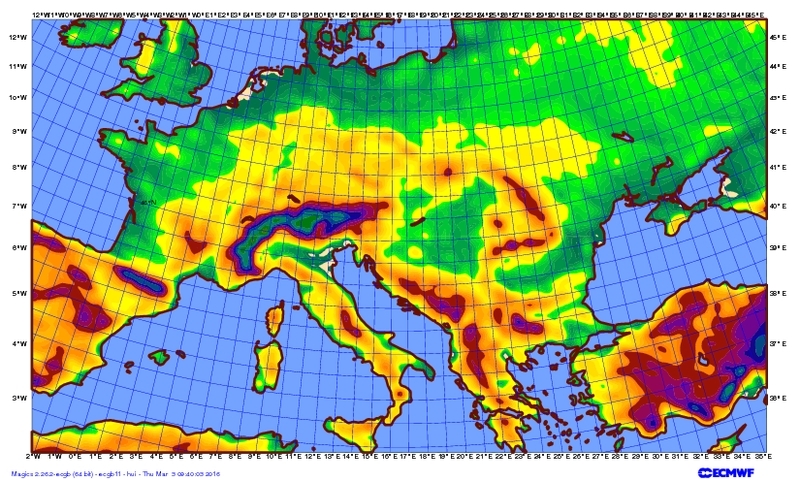 Graphical products partly help the forecasters’ work and partly available on external web. Verification of the numerical weather prediction models is an essential tool for people (forecasters, end users, etc) applying the model and model developers too. Verification of the deterministic models is an easier task than verification of the ensemble models. ECMWF provided a guidance for verification of the ensemble models (Nurmi, 2003). ECMWF has been regularly collected the verification results made by member states and co-operating states. This summary is available on ECMWF’s web. Verification is needed to be done at national level, because NMS-s have the best available observed datasets. 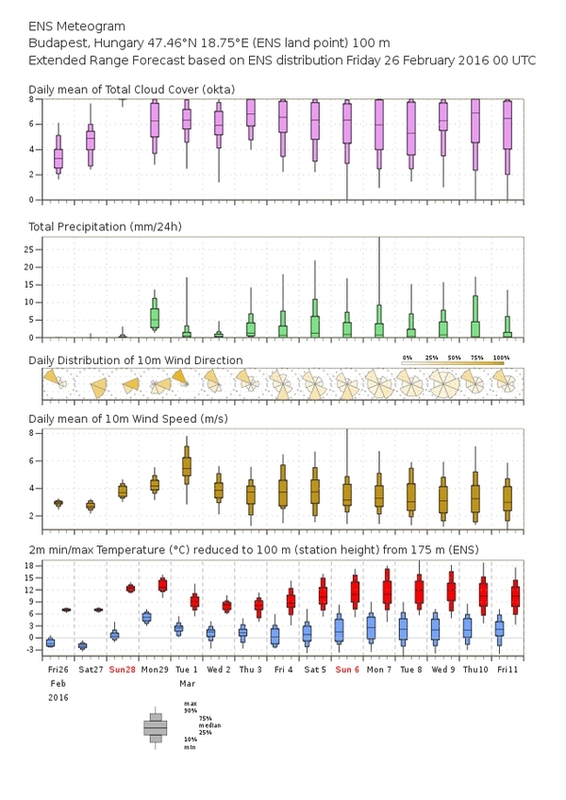 51 member ensemble forecasts can be used and displayed by several techniques. Besides ensemble meteograms and plumes so called spaghetti and stamp diagrams can be used well. Applying stamp diagram each weather patterns connected to the relevant ensemble members can be studied. By clustering the full set of the ensemble a few (2-6) main weather patterns are determined. Studying the clustering regimes potential reasons of the uncertainties can be determined and understood. Downscalling of the global ensemble systems can be made by several methods. Downscaling of the full (51 members) could not be achieved by and national meteorological services, including the largest ones, because it would need a huge amount of central processing unit (CPU) time. A limited area model, ALADIN/HU used in OMSZ was launching from the initial state of the 10 fixed cluster representative members. Comparison of the global and limited area models was investigated in case studies connected to severe weather situations. The numerical weather prediction models contain error as it was written in chapter “Fundaments of the probability weather forecasting”. 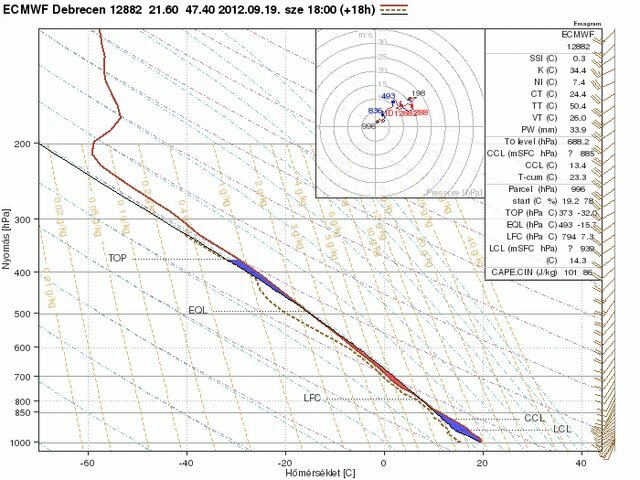 Besides the above mentioned reasons current 18*18 km-s horizontal resolution of the ensemble model could not subscribe the subgrid orography well. These problems can be partly solved by so called ensemble calibration. In the OMSZ so called calibration based on comparisons of the distributions was applied. Distributions of the model climate has been made from 20 years reforecast ensemble datasets twice a week since 2015. Each member of the current ensemble forecasts is compared to the distribution of the model climate. Frequency of each forecasted value was determined in model climate. Then calibrated values were determined by applying these frequencies in observed climate. To make successful weather forecast it is necessary to know the 3-dimensional structure quite well. 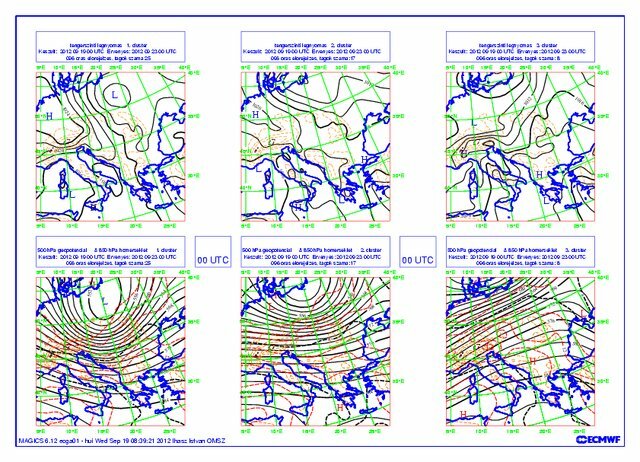 Applying ensemble forecasts partly ensemble meteograms and plumes and partly maps on isobaric levels are used. It’s important to note the complex application of these above-mentioned methods could not always described very preciously the changes of the atmosphere and uncertainties of the forecasted weather. A completely newly developed approach, the so-called ensemble vertical profile method can provide useful additional information. Fine vertical structure of the atmosphere can be studied by applying ensemble vertical profile in 3-hourly resolution up to 6 days. Forecast of the natural (volcanic ash) and anthropogenic (radioactive gas and aerosol) pollutants is an important task of the national meteorological services. Input data of the dispersion and trajectory models is the 3-D output of the numerical weather prediction (NWP) models. Dispersion and trajectory models are generally driven by deterministic NWP models. In 2011 and 2012 at the OMSZ a pioneering activity was done to develop a system when probabilistic dispersion and trajectory calculation are done. Dispersion and trajectory models start from representative members of the ensemble clusters. This method is quite fast and it does not require too much CPUs. 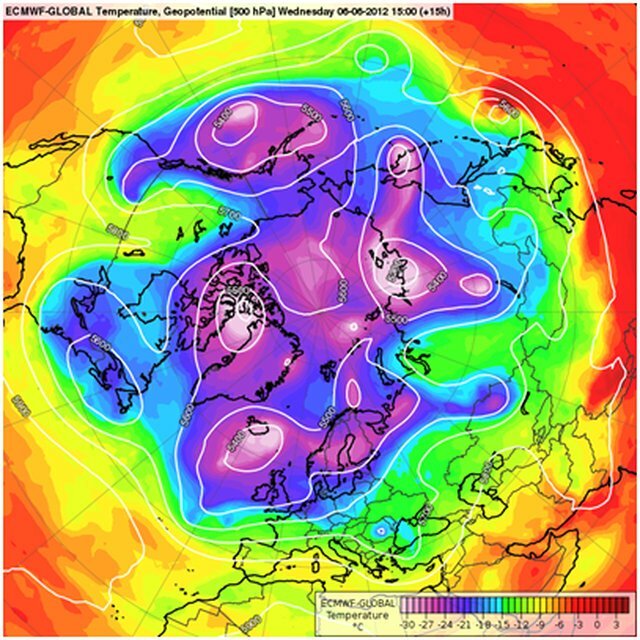 Cold drops or cold vortexes analysed around 500 hPa in the middle troposphere often cause severe weather, heavy snow showers in winters and heavy thunderstorms, occasionally tornadoes in summers. Forecast of these events are quite often not so easy. During in our study made between 2011 and 2014 statistical investigation was made on dataset collected from 150 cases from the last 15 years. Predictability of the cold droops was investigated based on ERA-Interim, deterministic and ensemble models. A new type plume diagram was also developed for characterizing cold drops well. 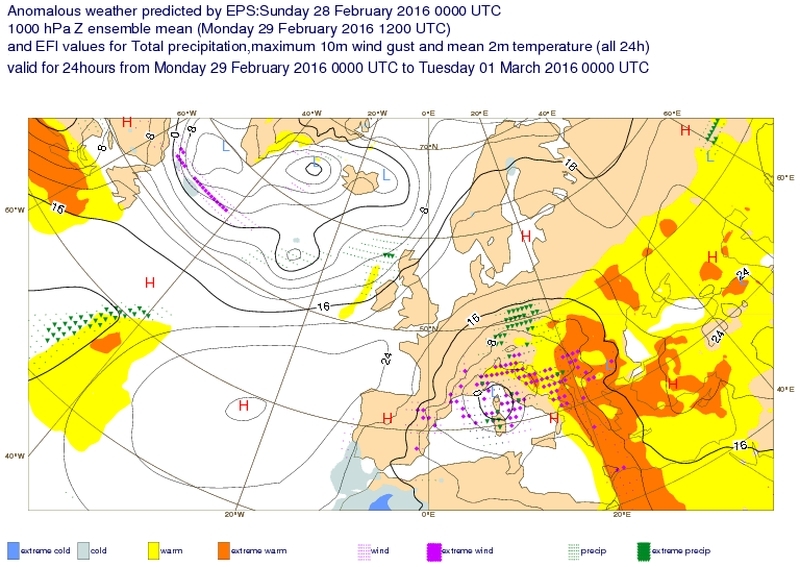 At the Hungarian Meteorological Service ECMWF model forecasts have been operationally used since 1995. ECMWF central data archive and wide range of developed ECMWF softwares are intensively used by the experts of the OMSZ, as we have free access to them based on the co-operating agreement between Hungary and ECMWF. Our researchers and forecasters are regularly taking part in the educational and training programme of ECMWF, since 2000 we have had opportunity to take part in the work of ECMWF in Reading. Medium range forecasts displayed on the web site of OMSZ are based on ECMWF model forecasts. Our several further services are also based on ECMWF forecasts. A summary about the validation of forecasts is shown on the verification portal of the OMSZ. Annual reports are available on ECMWF’s web. Easily comparable verification is made by common methodology by each national meteorological services of the ECMWF states and member states. 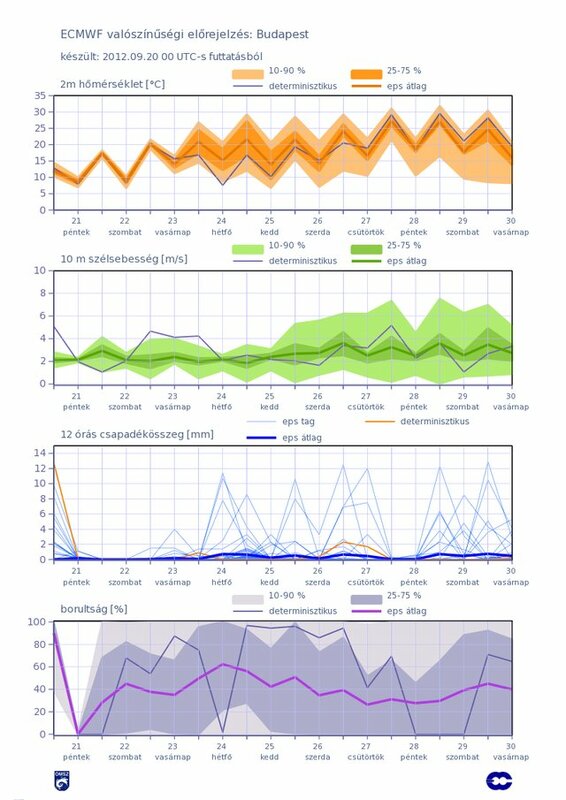 Plume: Ensemble plume made from all ensemble members shows probability in time, it can be made for any selected meteorological variable and any location. Its name comes from the shape of the figure. Figure contains the ensemble mean and deterministic model too. Ensemble plumes are operationally made twice a day for 14 Hungarian locations, and they are available on public web. Meteogram:Ensemble meteogram contains graphical forecast for cloudiness, 6 h precipitation, 10 m windspeed, 2m temperature for any selected location. Figure shows deterministic forecast (blue line), control forecast (red line) range (black vertical lines), lower and upper quartiles (green boxes) and median (black horizontal lines) of the ensemble. Deterministic pseudo TEMP, forecast in the vertical: Deterministic model forecasts meteorological variables on 137 levels in the vertical. In the practice isobaric charts are usually used, but use of the vertical profile can be beneficial to study more precious structure of the atmosphere. Figure shows vertical profile of the temperature, humidity, wind direction and speed. Ensemble vertical profile (probabilistic pseudo TEMP): The ensemble model forecasts state of the atmosphere in 91 levels in the vertical. The figure shows probabilistic distribution of the temperature, humidity, wind speed and direction in the vertical. Clustering of the ECMWF ensemble forecasts made for Central European area: During clustering some groups (clusters) of the forecasts are made from 51 ensemble members, numbers of the clusters are typically two or three, maximum number can be six. Number of the clusters depends on predictability of the forecast. Nowadays clustering is made on 120 and 192 hours forecasts of the geopotential field of 500 hPa isobaric level. Cluster mean and representative member of each cluster is calculated.